It’s not often that something comes across our Test Bench that we really want to brag about, but when it does, watch out. Every now and then reviewers get their hands on something that even they think is special, something that always draws some very obvious questions. and something that you can bet will be with them every time they meet up at tech events. 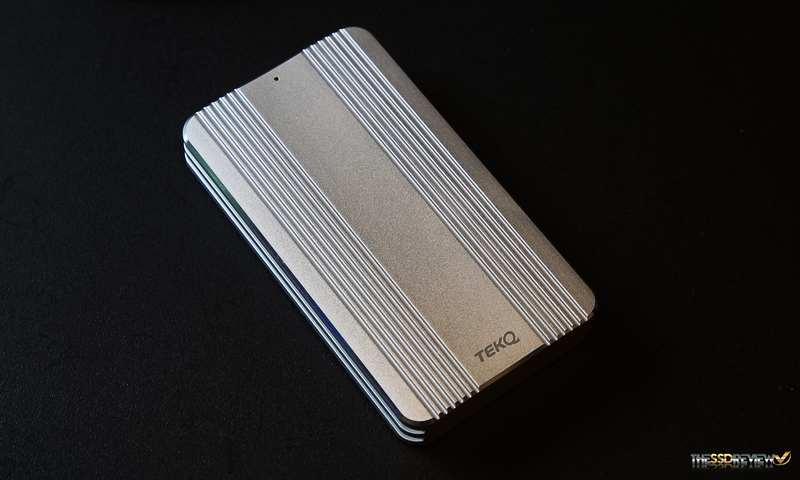 The Tekq Rapide TB3 Portable SSD is just that. It is compact. It’s build is by far the best we have seen in years. It is drop dead gorgeous. It’s storage speeds are not matched by anything worldwide. And it will ‘hopefully’ be available for purchase within Q1 2018. The Tekq Rapide is a Thunderbolt 3 Portable SSD that contains a PCIe 3 NVMe M.2 SSD and attains speeds of 2.8GB/s. It is the size of a business card and 1/2″ thick, the only port on the device being the Thunderbolt 3 port on the bottom end. 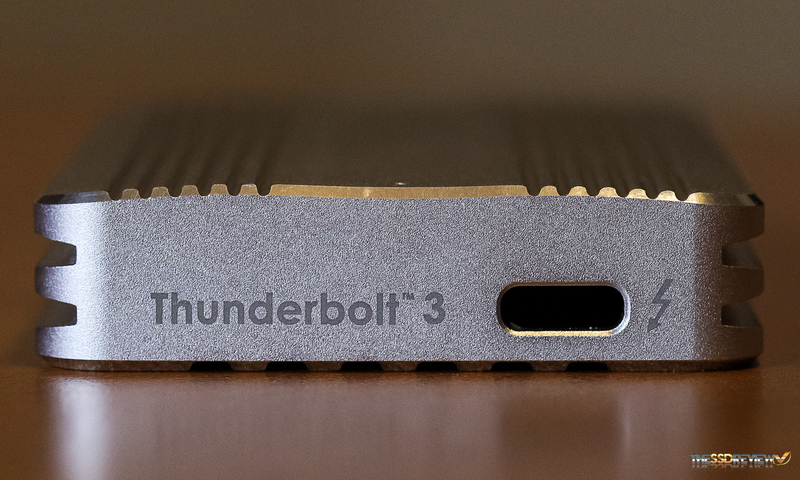 It is important to note that this device works ONLY WITH Thunderbolt 3 and is not backward compatible whatsoever, not even with Thunderbolt 2. It is bus powered so there is no need for an additional power source, connects via ThunderBolt 3 USB-C connector, is compatible with MacOS 10.10 and Windows 8 and up, and listed performance is 2.5GB/s read and 1.5GB/s write with up to 300,000 IOPS. Packaging of the TekQ will include a 0.5m Thunderbolt 3 cable, the Tekq Rapide and a Quick Start Guide. It is worthy of note that Thunderbolt 3 cables that exceed 0.5m will drop performance in half to 20Gbps unless they are listed as ‘active’ cables and do not exceed 2m; these cables being fairly pricey at present. So… what about the obvious question? How does a very unknown company pull this off long before the likes of Samsung? I mean, couldn’t we see just this in a Samsung T6 TB3 SSD? But wait… let’s talk about the exterior build for a minute as it impresses us to no end. Every Tekq Rapide is CNC cut and carefully shaped from a single block of aluminum; it has a unibody construction. You would be hard pressed to see this from Samsung as high quality as their products always are. 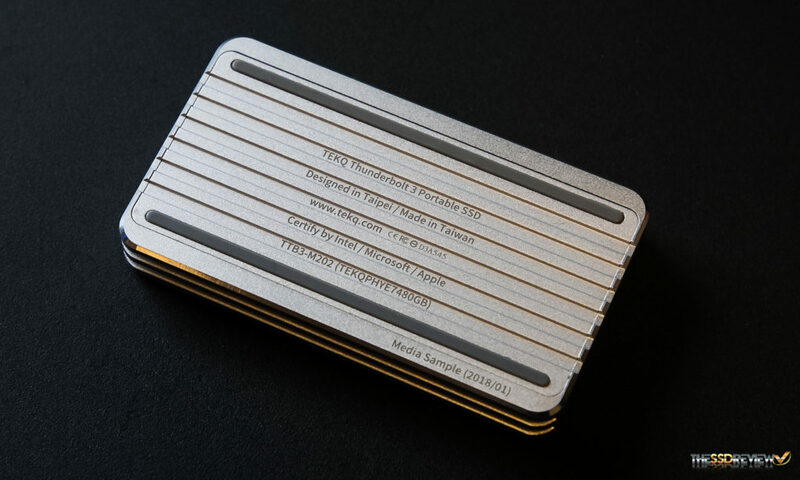 It is simply not feasible to spend so much on the CNC machining of such a high volume product in their case. 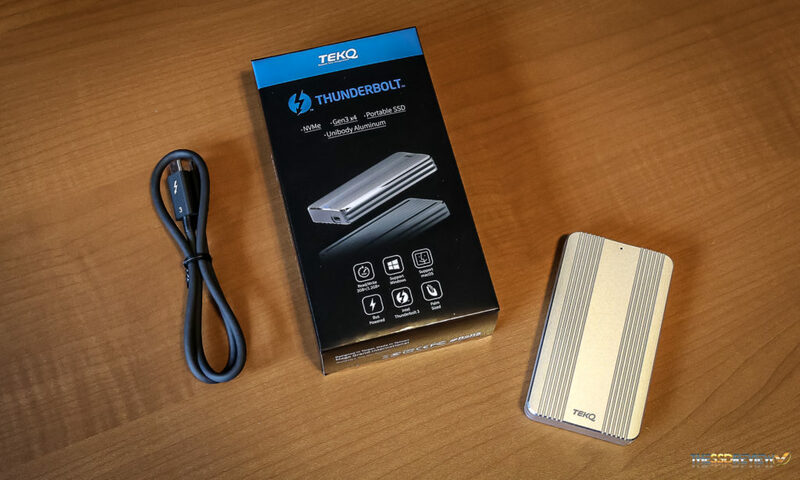 The exterior aluminum case is very carefully shaped to act, not only as an impenetrable shell for the electronics inside but, as a heat sink where this portable SSD uses passive heat dissipation by pushing heat to the external fins; no fan inside whatsoever. We can confirm that the case itself does get a bit warm when the SSD inside is being stressed, but nothing of concern. Also, everything on this case is etched. There are no branding stickers. All of the literature on the back of the unit is etched into the metal and we were particularly impressed with the bottom right ‘Media Sample (2018/01). 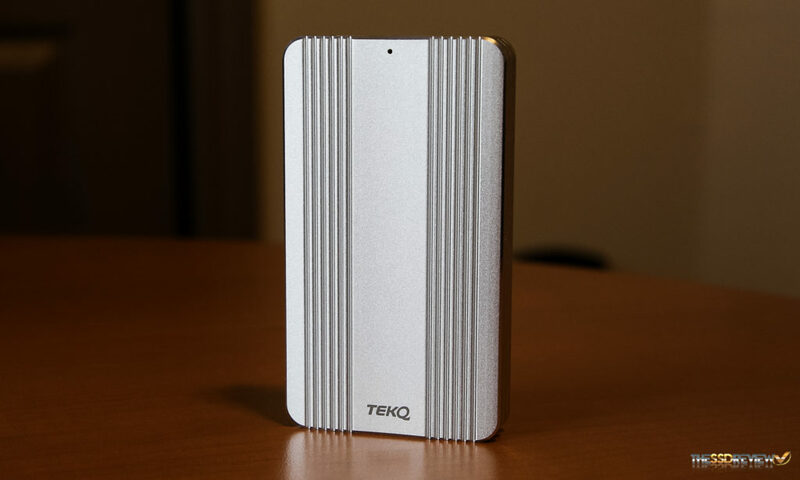 The Tekq Rapide will initially be available in capacities of 240, 480 and 960GB with an MSRP of $319, $479 and $899. Tekq will also be starting an Indiegogo campaign on 21 Feb 2018 where supporters can buy the Tekq at a 20% discount during the campaign. Interested buyers will have to be quick though as Tekq has only committed 243 samples to that campaign. Subsequent sales will then be through Amazon 2-3 months later. The Tekq Rapide will also include a one-year limited warranty. 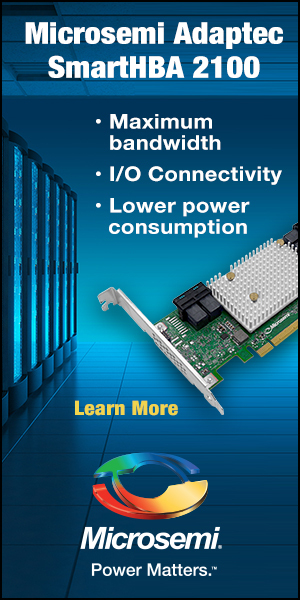 Good product, I thought about product of this kind, now they need to make it easly serviceable let us the option to buy empty shell and place for another drive to run it in raid. The key to this SSD is the firmware and that is why what you are saying is not so simple. I have tried 3 other M.2 SSDs in this unit…all higher capacity of course, and they cannot provide consistent benchmark results. 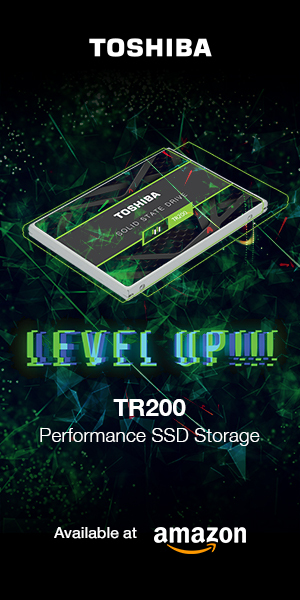 This M.2 SSD is matched specifically with this product having specific firmware. I even have same drive same capacity…nope. might be complicated to implement, but that what separates the good products from the great ones. Agree… well except there is only one of these in the world right now. Alfred here, the project manager of TEKQ. In fact we do have empty shell solutions but right now only accessible to business client. We didn’t know there was such a big demand for this when it comes to personal use. I’ll let the developing team know your request. It’s so interesting to see you disassemble this little thing LOL. You are more than welcome to send an empty shell solution this way for testing if you like. I have several M.2s and get them regularly. So far, I have tried the 960 Pro 2TB, OCX RD400 and the original oem Toshiba 1TB drive…without much luck in the Rapide I am afraid.